On November 30, 2000, the first anniversary of the American Village, a number of clergy members joined the Chapel board in consecrating ground for an entirely privately-funded non-denominational chapel to be built in thanksgiving for God’s blessings on America. On an acre donated for that purpose by original land owners, the late T. M. and Ellen Virginia Burgin, the Board, under the tireless leadership of retired Birmingham pediatrician Dr. Dewey White, and business and civic leader Hall W. Thompson, raised funds from hundreds of individuals. 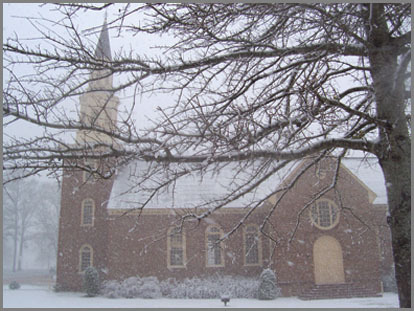 The Chapel was completed and consecrated May 6, 2004. On May 21, 2006, it was officially named and dedicated as the Lucille Ryals Thompson Colonial Chapel, to honor her and her family’s long-standing national and state leadership in support of the teaching of American history. 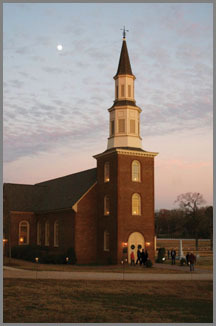 The Lucille Ryals Thompson Colonial Chapel Foundation at the American Village is a privately-funded non-profit foundation. "Faith and Freedom" publications and events are sponsored entirely by private gifts to remember our country's heritage of religious faith as a foundation for our freedom. 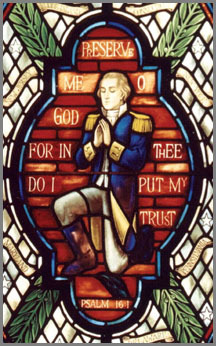 Download the Chapel Foundation brochure “Faith of Our Founders” here.